Sir Elton John has called on people to "shout back" against homophobic abuse, "whether the bigot is in our local pub or a thousand miles away". People were persecuted all over the world "just because of who they love and who they make love to", he said in an article in the New Statesman. "We should all stand up and speak out for basic human rights," he said. 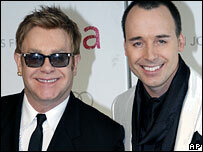 Sir Elton, who turns 60 on Sunday, "married" long-time partner David Furnish in a civil partnership in 2005. The singer said the union was his legal and human right, adding: "And I wanted everyone to know, I wanted to shout about it." But he went on: "In some countries, my voice would have been drowned out. Maybe even stamped out. Sir Elton cited the example of El Salvador gay rights activist William Hernandez, who has been threatened at gunpoint and suffered a raid on his organisation's offices. "People like William are a lot braver than me," said Sir Elton. "My voice has served me pretty well over the years; I hope maybe it can do him some good too. But we need more voices. Sir Elton was writing in the New Statesman's It Could Have Been Me column, published in association with Amnesty International. Last November Sir Elton criticised Australian Prime Minister John Howard after his government overruled a local law allowing gay unions. And in an earlier interview with the Observer newspaper, he said he would like to see all organised religion banned and accused it of trying to "turn hatred towards gay people". The star is to play a record 60th concert at New York's Madison Square Garden on his birthday on Sunday. The following day, his back catalogue, spanning four decades, will be available to download for the first time from online music store iTunes. Sir Elton has sold more than 200 million albums worldwide since the 1970s, with hits including Rocket Man, Candle In the Wind and Saturday Night's Alright For Fighting.